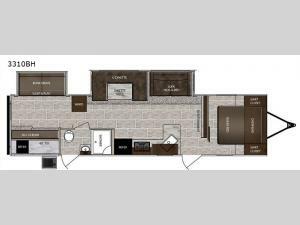 Just imagine dual entry doors into the trailer, double slide outs for more floor space in the main living area, the bunkhouse, and double kitchen areas (one inside and one outside), making this LaCrosse travel trailer a crowd pleaser. You can easily enter into this model from the main area or straight into the full bathroom. Just imagine the kiddos laughing and playing in their own bunkhouse on a rainy day. They will surely love the two bunks and the Sleep and Play. Head outside when the weather is just right to enjoy the 19' electric awning and the outside kitchen cook center with an exterior 40" TV. Come see many more features to enjoy luxury and convenience each time you load up the family!